Police searching for clues in three car bomb plots investigated a rented house near Glasgow, where media reports speculated Thursday that bombs had been made. The government lowered the terrorism threat level from critical to severe after the arrest of eight people connected with the three failed attacks, but authorities were still investigating the possibility there may be other suspects on the peripheries of the plot still at large. The derailment of a subway train in London during the Thursday morning rush hour briefly raised the anxiety level in the capital, but police said the accident was unrelated to the terror plots. At least 37 people suffered injuries, most of them minor, authorities said. "Obviously the first thing that goes through your mind is "Is it terrorists?"' said passenger Jacqui McElroy, who described how the train seemed to lift up as it rounded a corner at Bethnal Green. At least two of the suspects — most of whom are doctors — are believed to have rented a house just a few miles from the Glasgow airport, where two men crashed a gas-laden Jeep Cherokee into the barriers outside the main terminal on Saturday. British news outlets, citing unidentified sources, said the two men slept upstairs in the house and used the downstairs to put together bombs. Police have refused to identify which suspects lived in the house, but Denis O'Donnell of the local Paisley Cab Company, said his taxis had picked up Iraqi-born physician Bilal Abdulla from the house nearly 20 times since May. Brian Harvey, a 60-year-old construction worker who lives on the street where the house is located, told The Associated Press he had seen a green sports utility vehicle outside the property that was being searched. Police were still outside of the house on Thursday morning. Neighbor Susan Hay told AP that police said they were "stripping" the house to look for fingerprints and other forensic materials. The large tent — set up on Sunday — was still hanging over the garage. Scotland Yard would not confirm or deny the reports. A British investigator, meanwhile, was questioning an Indian doctor arrested in Australia. Australian police arrested Muhammad Haneef, 27, on Monday in the eastern city of Brisbane as he tried to board a flight with a one-way ticket, believed to be to India via Malaysia. 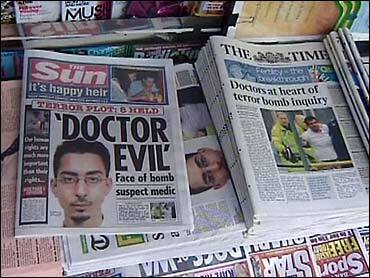 Haneef, who moved to Australia last year, worked in 2005 at a hospital in northern England where another suspect arrested in connection to the failed attacks also worked. Six physicians are among the eight suspects, including the Iraqi Abdulla, one from Jordan, two from India and a man reportedly from Lebanon who trained in Slovakia. Also in custody are the Jordanian's wife, a medical assistant, and a doctor and medical student thought to be from the Middle East. None has been charged in connection with the Glasgow attack or the two bomb-laden cars found, unexploded, in London a week ago. With all suspects connected to the medical profession, Prime Minister Gordon Brown has ordered an investigation of the procedures of recruiting foreign doctors, which Health Secretary Alan Johnson promised would be done "very quickly." "It is what more we need to do between striking a balance between ensuring that we have people with the right skills in this country to make sure the NHS (National Health Service) works properly and how we ensure we have a proper oversight of security," he told British Broadcasting Corp. radio. Details of at least some of the suspects were found logged on a database kept by the domestic intelligence agency MI5, a British government security official said, but they were not among an estimated 1,600 people kept under surveillance by the agency. The official said the latest suspects were not linked to earlier attacks or thwarted plots in Britain. Intelligence sources told CBS News that Abdulla had been under surveillance before the attempted attacks. CBS News confirmed that Britain's domestic intelligence agency "was aware" of at least two of the plotters before the two failed car bombs were found Friday morning in London. Sources said MI5 came across the suspects in the course of an investigation into Hizb ut-Tahir, an Islamic group banned in Britain after the July 7, 2005 attacks. Friends of Abdulla, who was in the Jeep that crashed into Glasgow airport, told CBS News that he is a former member of Hizb ut-Tahir.